This page is a response to the discussion on barefoot and shoeing: back to shoes with one horse, because of arthrosis To understand the full context of this page, we invite you to read the contribution by clicking on the link, and the comments which follow. This is a fascinating discussion, which essentially comes down to differing beliefs about how much a living being is capable of transforming and healing. 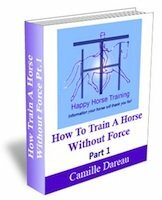 This actually touches on Happy Horse Training's central philosophy, and the overall goal of our work with horses. Western society and conventional science are underpinned by the belief that reality is governed by certain mechanical principles that are unalterable, and this belief has a very influential role on the general conception of healing in our culture. There are countless health problems that are believed to be incurable, and physical states that are thought to be fundamentally fixed. In fact, at the cutting edge of science - and in disciplines as diverse as physics and biochemistry - the previously accepted ideas of the fixed nature of matter is being blown away by research that demonstrates our physical reality to be incredibly dynamic on the most profound level. The fact that the wide-spread belief systems dismiss this evidence, reflects how strongly we have been conditioned to a limited perception of reality, and what both our own bodies and other living beings are capable of. How does this relate to horses feet? All of the work we do with horses is founded on the belief that all life has, at its core, unlimited potential for change, and carries within it a blueprint for health. Difficulties and problems are as a result of energetic limitations which block the physical manifestation of health. These limitations can present themselves in any number of ways - genetic traits, trauma from physical or emotional damage, and so on - but essentially these are all, at root, ENERGETIC states, and therefore have the potential to be undone so that health can flow through and manifest physically in the body. 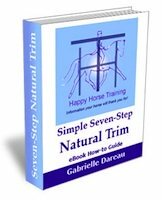 This may seem a very esoteric approach, but it is backed up by many solid experiences that we have had with horses, humans, and other animals. We have seen, for example, severe conformational limitations overcome, genetically defective hooves transform, and physical and emotional problems, thought to be incurable, resolve themselves. In fact, we believe that in life the greatest limitations that we face, whether we are born with them or acquire them, can become our greatest strengths, if we are able to see through them to the underlying perfection that is innate to all life. My personal experience of this was being born with a scoliosis - a curvature of the spine - which, from the moment of its diagnosis when I was 7 years old, was presented to me by doctors as utterly incurable and unalterable. 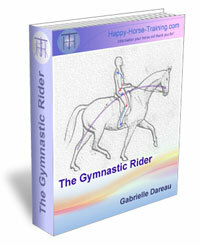 On top of fears that it could dramatically worsen as I grew, this faced me with a hopeless situation concerning my riding potential - I was well aware that the biomechanical evenness of the rider is indispensable to correct riding. Like the horse whose shoe-damaged feet are sensitive without shoes, I experienced years of discomfort due to my scoliosis, but I was determined not to resort to quick-fixes that would have blocked my body's healing process, such as painkillers, back-braces or even surgery. For me, shoeing a sensitive horse is an equivalent quick-fix that I would not want to impose on a horse who does not have the choice. A combination of regular Cranio-Sacral Therapy, and years of determined persistence with my riding have made me even and straight to the point where my scoliosis is no longer an obstacle to my riding, nor a problem to me in any other way. In hindsight, I am grateful to this challenge because it profoundly informed my understanding of straightness for both horse and rider, as well as opening my mind to the possibility of overcoming seemingly fixed limitations. We believe that horses, too, are faced with precisely the problems that give them the opportunity to heal their limitations, and as their carers we can consciously participate in this by believing in their potential for health and happiness. We have found that it is only through this faith in the healing process that we become aware of the right action to take to support and promote it. This is why, personally, we would never resort back to shoes in a case such as this, because they are by nature an impediment to healing, even if they may hide the problem well. This approach is not narrow-minded, but on the contrary profoundly open-minded, because it is about seeing the potential for health and change in ANY scenario. Perfect health may not always be fully achieved (in this life!) but the more we trust the process of healing, the more it continues to surprise us.